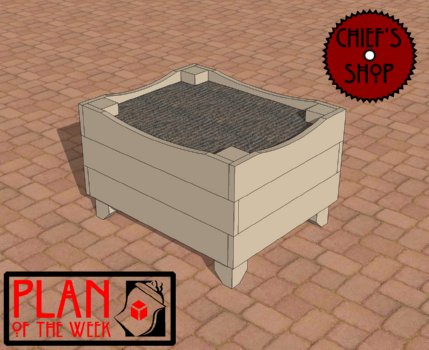 Place the Chief’s Shop Patio Planter on a patio as the name implies, or on a deck, front porch, or anywhere in your garden. Build one or several to balance out your selected space. My usual tool suspects are needed to complete it – miter saw, jig saw, drill driver, and Kreg Jig HD or a regular Kreg Jig. It’s made from 5/4x6 deck boards, a 2x4, and a 4x4.